The list of ingredients for this curried coconut chicken recipe may seem long, but it’s a very quick recipe to make. Once you have all of the ingredients assembled, it is very easy to put together. This is a very healthy dinner recipe too. Everything on this ingredient list packs it’s own nutritional benefits into this easy dinner recipe (well, except the bit of sugar, which is optional, and which I personally leave out). Cut the chicken into bite-size chunks. In large heavy saucepan, heat 2 teaspoons of the oil over medium-high heat. Cook the chicken, stirring often, for 2 minutes to brown slightly. Transfer to a plate. Add the remaining oil to the pan and reduce the heat to medium. Add the curry powder or paste, garlic, lime zest, coriander, cumin, sugar, salt, chili paste and pepper. Cook, stirring, for 1 minute. Add the mushrooms, carrots, onion and lime juice. Cook for 10 minutes or until mushrooms turn golden and no liquid remains. Pour in the coconut milk and cooked chicken. Bring the mixture to a boil. Cook for 5 minutes. Reduce the heat to medium. Stir in the chopped tomatoes and peas. Cook for a few minutes to heat the peas and tomatoes. Add the fresh coriander and cook for 1 more minute. Serve over Basmati rice, or try something different by serving this easy dinner recipe over cooked quinoa. This wonderful Thai styled coconut chicken curry is full of sublime flavors. It is SO yummy, that once I got the recipe, I wanted to make it over and over again. I think you will too. Of course, the health properties of coconut and coconut milk is – finally – well known. Coconut milk is a wonderful addition to curries and other sauces. It not only adds great taste, but fantastic nutritional value as well. A curried coconut chicken recipe like this one with vegetables, lean protein, healthy herbs and spices and coconut milk is a healthy dinner recipe that the whole family will probably love. There isn’t an ingredient in this recipe that isn’t healthy. Even a good quality oil is healthy in moderate amounts. So try this sublime easy dinner recipe any night of the week. This Thai coconut chicken recipe is gluten free, fairly low carb and a great diabetic recipe. 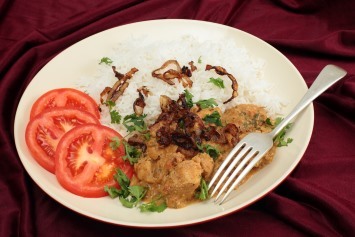 For another version of Thai coconut chicken you may want to try, look here.